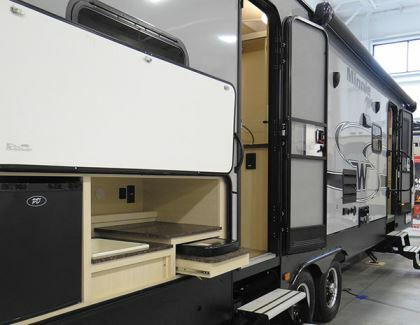 A bunkhouse and a variety of family-friendly features provide the makings of great adventures in this Winnebago Minnie Plus travel trailer from an iconic RV manufacturer. Winnebago Industries celebrated a landmark 60th anniversary on February 12, 2018. Over the years, “Winnebago” has become a moniker that many non-RVers assign to every motorhome they encounter. Much like Band-Aid, Kleenex, and Jacuzzi, brand names often used in generic form, some see the Winnebago name as being synonymous with “motorhome.” Today, though, Winnebago is not just about building a variety of Type A, B, and C motorhomes. The company also offers a complete lineup of travel trailers. 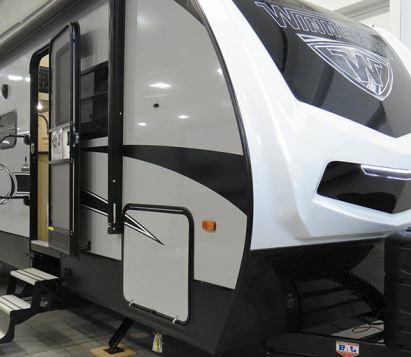 After ceasing travel trailer production in 1983 to focus solely on motorhomes, Winnebago re-entered the towable market in 2010 by purchasing Sunnybrook RV, an asset that was trumped even further by the surprising acquisition of Grand Design in the fall of 2016. 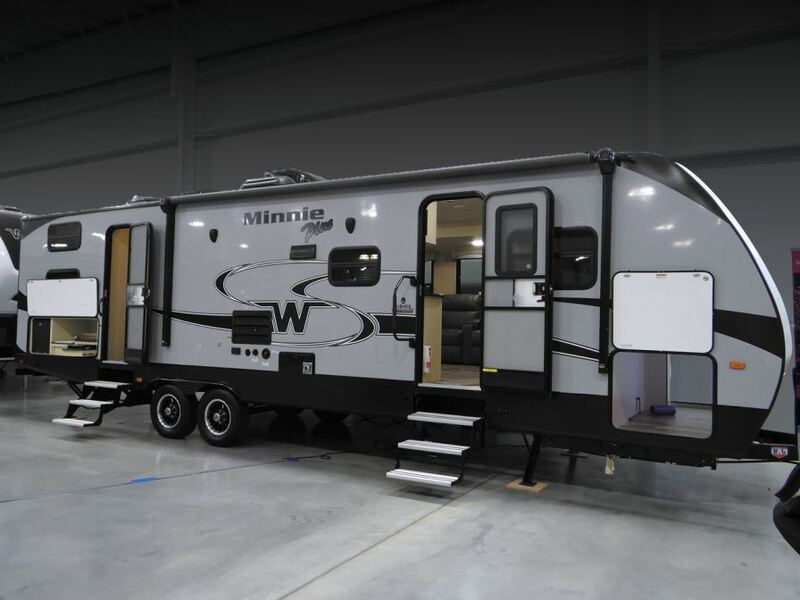 And just last year, Winnebago reorganized its travel trailer offerings into today’s full line of Winnebago Minnies, including the Minnie Drop, the Micro Minnie, the Minnie, the Minnie Plus travel trailer, and the Minnie Plus fifth-wheel. All but the Minnie Plus fifth-wheel are available in six or more floor plans. Winnebago trailers are constructed on the venerable and well-tested NXG (next generation) frame produced by BAL RV Products Group. Known for its high-strength, low-alloy (HSLA) steel, the design includes tightly controlled construction properties for both conventional travel trailer and fifth-wheel frames. This frame boasts strict use of CNC technology, minimum manual welding requirements, and precise component placement, and can be found under many different brands of towable RVs. Winnebago Minnie buyers select one of eight vibrant exterior colors. That and the high-gloss T60 fiberglass sidewalls, coupled with a signature front cap, make for an interesting conversation starter as one pulls into a campground. The T60 panels are fabricated using a moving mold process, which results in an exceptionally smooth, high-gloss, gel-coated sidewall. Polyester resin with a patented, chopped-glass matrix forms a strong corrosion- and mold-resistant finish with very low maintenance requirements. Another relatively low-maintenance synthetic, TPO (thermoplastic polyolefin) membrane, tops the roofs on all units in the Minnie lineup. I counted 30 different floor plans in the towable lineup for 2018, but I had to choose just one for this review. So, I invite you to take a look at the 2018 Minnie Plus 31BHDS. “BH” signifies bunkhouse and “DS” is for dinette slideout. I’m not usually a fan of an up-front master bedroom in an RV, as I prefer a more secluded rear location. But my hesitation soon grew into a realization that this floor plan is quite suitable for any active RVing family with children. With multiple sleeping berths in the very rear — the bunkhouse — it makes perfect sense to ensconce the parents at the extreme other end of the RV. This Minnie has two entry doors. The one near the rear permits quick access to the bathroom from the outside, as well as a pathway to the RV interior. The forward door opens into the main living area. From a safety standpoint, having two methods of egress is always better. A roomy, full-width, pass-through storage compartment stretches across the front of the Minnie Plus — perfect for long or awkward-size camping items such as fishing poles and folding camp chairs. On our review unit, a 20-foot powered Solera awning graced the curb side, from the forward entry door to the rear axle. I would have liked for it to extend all the way to the rear so that it covers the nifty outdoor kitchen, or at least far enough to cover the rear entry door. A second awning is optional for this floor plan, but the main, powered patio awning with LED lighting is a standard feature. Winter RVing aficionados will appreciate that Winnebago Industries offers an Extreme Weather Package as an option, as well as dual-pane windows. At first glance inside the rear door, it may appear odd to see a toilet sitting there, but given the overall theme of this versatile floor plan, it is justifiable after all. An RV with a bunkhouse presupposes the presence of kids, siblings, guests, or others traveling together. Hence, with outdoor activities, having easy access to the lavatory facilities without having to traipse through the living sections of the RV just makes sense. The one feature everyone will be drawn to is the aforementioned outdoor galley, located on the curb side at the right rear corner of the RV. 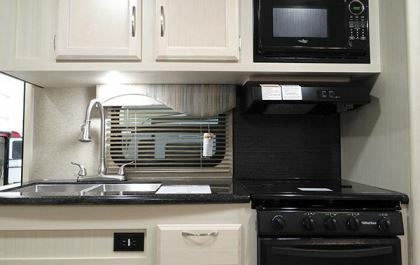 Behind a solid compartment door, Winnebago designers installed a 1.6-cubic-foot Pummell Drive AC refrigerator; a wet sink; and a slide-out, two-burner cooktop as part of this popular feature. 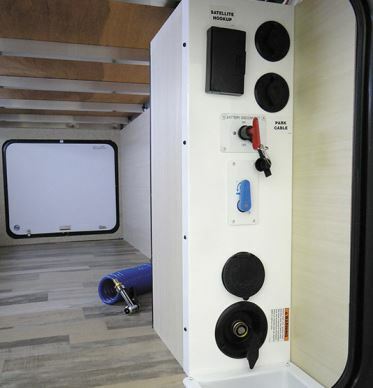 Around the corner is a 10-gallon RV water heater, installed at the very rear of the unit. It can be powered by propane or 120-volt AC when connected to shore power. A roof ladder is mounted at the rear of the Minnie Plus. The 31BHDS is equipped with two slideouts, both on the street side of the RV. The rearmost slideout encapsulates a single fold-down bunk positioned over a 72-inch-long sofa bed. Two additional bunks are located across the aisle. As is typical with every RV, the waste plumbing connections, the termination valves, and the shore power connection are located at the left rear quadrant. All holding tanks are safely enclosed and insulated inside the undercarriage. A quick-disconnect propane fitting for a barbecue grill or camp lamp is mounted near the frame. At the front left corner, inside the pass-through bay mentioned earlier, sits a utility station that includes fresh water connections for the city water and tank fill, a quick-release hose bib (for rinsing off sandy feet), plus inputs for satellite and park cable TV connections. A main battery disconnect switch also is conveniently mounted here. The front end features a stylized, painted front cap bearing the familiar “W” logo and is accented with LED lamps; it’s available only on the Minnie, Minnie Plus, and Minnie Plus fifth-wheel. Twin 30-pound DOT propane cylinders for the gas appliances are mounted below a protective cover. For ease of hitching and unhitching, a Lippert Components electric tongue jack sits atop the hitch coupler. Lippert Components provides many products for the Minnie Plus, including electric stabilizers, entry steps, interior furniture, and the LED-lighted patio awning. 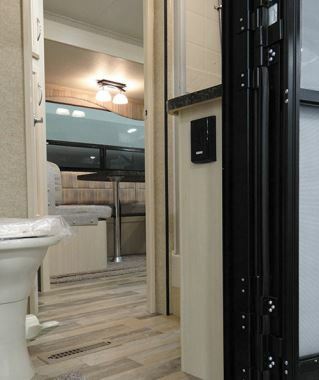 As one steps up into the forward entry door, the master bedroom is to the right, behind the entertainment center, which splits the width of the RV and serves as a room divider, allowing access to the bedroom from both sides. The queen-size bed is centered on the forward wall, flanked by nightstands and wardrobes. Both sides have 120-volt-AC electrical receptacles and USB charging ports. A set of cabinets stretches from wall to wall above the bed, with individual reading lamps hanging below. As noted, the entertainment center divides the bedroom from the living area. It houses twin pocket doors to maintain privacy on the bedroom side. It also holds the LED television, a Bluetooth-capable Jensen AM/FM/CD/DVD/USB system, and storage cabinets above and below the TV. 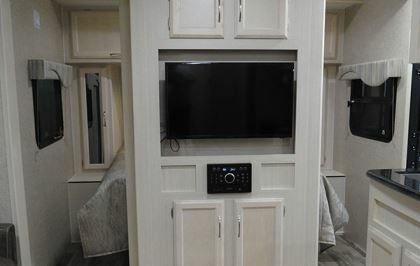 A cool little knickknack shelf courses around the sides and front of the entertainment center near the ceiling for use when the trailer remains stationary for a spell. To the immediate left of the front entry door, on the curb side, stands the galley. A deep, double stainless-steel sink is mounted in the solid-surface countertop. A microwave oven hangs directly above the recessed three-burner propane range. Roomy cabinets above and below the sink provide storage, along with four deep kitchen drawers. Further rearward, the double-door gas-absorption refrigerator sits adjacent to the range and directly above the AC/DC electrical control panel. Across the aisle from the galley, snuggled in a slideout room, is a U-shaped dinette and either a sofa or, as in our review unit, theater-style recliners. A dinette table with chairs also is available as an option. Plenty of light shines naturally through the windows in the slideout and through the galley window across the aisle. Storage space is always an important consideration for the active RVing family. It stacks up nicely in this Minnie Plus. A huge, floor-to-ceiling pantry graces the interior of the 31BHDS, just rearward of the refrigerator. 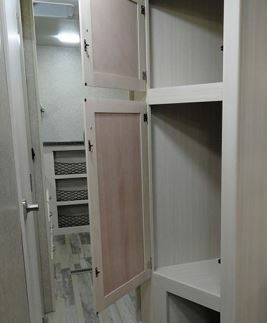 A large wardrobe, which also could be used as pantry space, stands across the aisle and to the rear of the slideout. The lavatory represents a utilitarian viewpoint appreciated by folks more interested in activities at their destination than in living in luxury. This is not to say it’s lacking; it has everything an RV bathroom must have: a toilet, a shower, a medicine cabinet, a mirror, a stainless-steel sink, etc. Standard features not previously mentioned include a 15,000-Btu rooftop air conditioner (a second unit can be added as an option), a TV antenna with booster, sharp-looking aluminum wheel assemblies, and Zamp prewiring for solar battery charging. 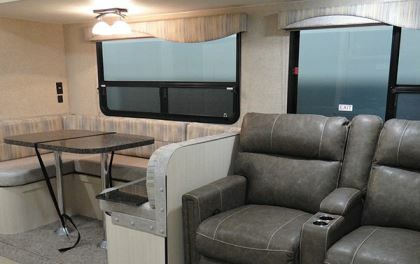 With the ability to sleep nine to 11 people, depending on the options chosen, the 31BHDS Minnie Plus will be of interest to an active family looking to head out for adventures and a variety of favorite outdoor activities.